Social cohesion is often defined as the glue that holds a society together. It refers to both the horizontal relationship between different groups in society, and to the vertical relationship between people and the authorities. When a conflict fractures a community, it often decreases levels of social cohesion. USE — the UN Social Cohesion and Reconciliation Index for Eastern Ukraine — is an analytical tool developed in Cyprus and used in several other conflict-affected contexts. Implemented by three UN agencies (UNDP, UNICEF and IOM), USE is designed to help improve the understanding of societal dynamics in the east of Ukraine. By capturing the views of more than 10,000 people, USE provides a detailed analysis of the strengths and weaknesses of social cohesion, and identifies entry points for how it can be strengthened. 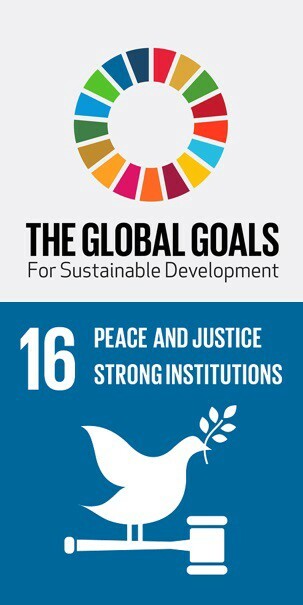 USE is both rooted in and informs the Sustainable Development Goals agenda, in particular Goal 16, and the United Nations Development Assistance Framework for Ukraine 2018–2022, providing for an integrated UN mechanism for measuring progress towards a peaceful and inclusive society for sustainable development. ■ belonging, and responsible citizenship. These four outcomes were identified through consultations with civil society and authorities in Kyiv and in the five eastern oblasts. The results of the 2017 USE wave are now available on an interactive online platform, which allows users to use the data to visualize the analysis by both topic and geographical area. In the next paragraphs, we are highlighting some key findings from each of the four USE outcomes, together with some possible entry points for policy and development interventions. Adaptive psychosocial functioning refers to the overall state of psychological well-being, and is one of the great strengths of communities in the east of Ukraine. The average score for adaptive psychosocial functioning is 7.8, where 0 means low community support capacities, and 10 indicates strong support within the communities. Particularly high levels of family coherence and executive functioning skills point to a solid foundation in terms of support networks and every-day interactions in public life. However, anxiety and depression are also present. People over the age of 60, women, and those who do not work (pensioners, unemployed, people on parental leave etc.) show the highest levels of anxiety. 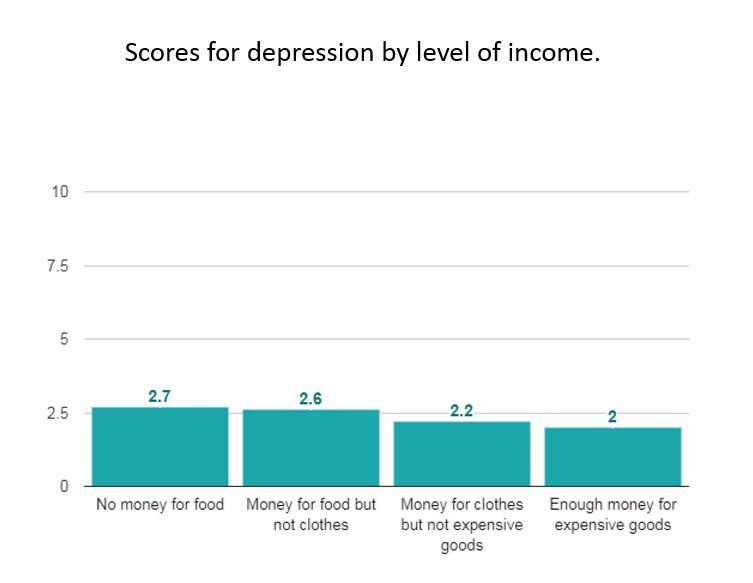 The USE analysis also shows that depression is more prevalent among people who struggle financially, and is somewhat more present among residents of Dnipropetrovsk oblast than residents of the other four oblasts. While migration in itself is a neutral phenomenon reflecting the mobility of the population and freedom of movement, large-scale migration may disrupt social dynamics, affect the local economy and lead to brain drain. As in many parts of the world, it is the young population that is most inclined to want to leave. The southern part of Donetsk oblast, where the city of Mariupol is located, shows the lowest migration tendency; while the rural east in Luhansk oblasts shows the highest. Migration tendency in the east of Ukraine is closely linked to media consumption: people who consume online media (who are on average also younger) are more likely to want to migrate, compared to the (normally older) consumers of traditional media. This is an intuitive finding but it points to the need to actively use online media to reinforce cohesion and provide avenues for younger residents of eastern Ukraine to engage and participate in shaping their future. The factor most strongly influencing people’s wish to stay in their communities is neighborhood support, meaning the feeling that neighbors are supportive and can be relied upon. An entry point for mitigating negative population trends is thus to build on the existing local community networks when working on issues of local governance, such as the community amalgamation process in the context of decentralization reform, or the development of local infrastructure. Older residents and those living in rural areas have a stronger sense of connectedness and belonging than the younger and urban population. 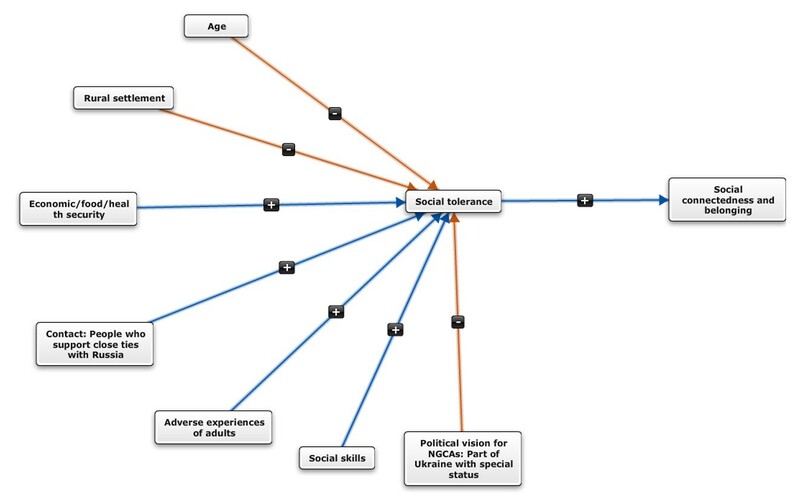 An important indication of connectedness and belonging (or the lack thereof) can be found in the extent to which a person feels socially excluded in their community. While USE does not specifically explore levels of social exclusion among marginalized or minority groups, it emerges from the analysis that feelings of social exclusion are mostly related to income, level of education and employment status. Another important component of social connectedness and belonging is people’s feelings toward various different groups in society. 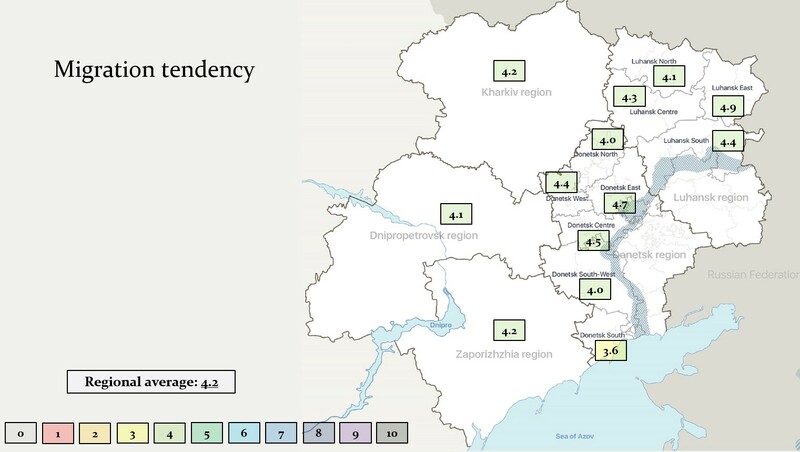 Results show that people from the five eastern oblasts demonstrate high levels of openness towards other people from eastern Ukraine (including IDPs), as well as towards people from western Ukraine. However, levels of openness towards people with radical or uncompromising political views are lower. This indicates that political preferences elicit stronger reactions than regional origin. The USE analysis shows that what impacts the strongest on people’s feelings of connectedness and belonging is the level of tolerance toward minorities and marginalized groups. The younger and urban population, as well as the population with higher education, show the highest levels of social tolerance; in terms of oblasts, Zaporizhzhia shows the highest levels. A further level of analysis shows that another important indicator of social tolerance is economic, food and health security. The more sure people feel that their basic needs are met, the more likely they are to be tolerant towards others. Similarly, people who are in close contact with those who support close economic, cultural or family ties with Russia are more likely to be tolerant towards others, as are people who know someone who has had a traumatic life experience. Factors impacting on social tolerance. Red arrows indicate a negative association, and blue arrows a positive association. These findings point to the need to create spaces that encourage dialogue among different groups. In the same way, supporting cooperative business development and increasing levels of economic security may have a positive outcome on social cohesion. Levels of active, non-violent civic engagement are low throughout the east of Ukraine. The USE analysis shows that the main reason is a perception that the authorities neither engage citizens in decision-making, nor are responsive to citizens’ demands. A second reason is the people’s feeling that they lack knowledge on what is on the local councils’ and other authorities’ agendas. A further disincentive for civic engagement is the sense of political insecurity: in the east of Ukraine in general, and in south-western Donetsk oblast in particular, many people do not feel comfortable expressing their views and instead opt out of socio-political processes. Unsurprisingly, therefore, the propensity for political violence is consistently low (another important element of tolerant and socially responsible citizenship), in particular in Donetsk oblast. However, the younger and male population and those who know someone who had a traumatic experience are more prone to turn to violence to achieve change in society. Based on all the above, potential entry points for supporting and promoting tolerant and socially responsible citizenship include the creation of mechanisms to facilitate public engagement at the community level. This could include, for example, online platforms to inform citizens about council meetings and issues on their agendas, and provide an opportunity for citizens to contribute without requiring them to travel to the meeting venue. To increase the sense of political security, ‘safe spaces’ can be created where different and alternative views can be expressed without any fear of political, social or economic repercussion. To address low trust in institutions, key interventions are those improving service delivery and participatory decision-making mechanisms. Nonetheless improving the delivery of services requires a local approach since the types of services considered to be in most need of improvement differ considerably throughout eastern Ukraine. For example, the provision of social services is perceived as being notably low in Zaporizhzhia oblast, while improving the public transportation network is a more pressing issue in Luhansk oblast. For further information, please visit use.scoreforpeace.org. We partner with people at all levels of society to drive and sustain the kind of growth that improves quality of life for everyone.